Casa Feliz Historic Home and Venue is an historic home that was close to being destroyed for a modern structure. It was located on a local lake in Winter Park, Florida. Local residents resisted the destruction process and the home was saved. However, it had to be moved to its current location, nestled along a scenic golf course the Winter Park Country Club. Winter Park is located just a few miles north of Orlando just I-4 and convenient to the area’s parks such as Walt Disney World Resort, SeaWorld Orlando, Universal Orlando Resort and Gatorland. April and Doug chose the venue due to its historic beauty. The event was a smaller and intimate gathering with just over 80 attendees, and the venue presented the perfect setting for their special day! 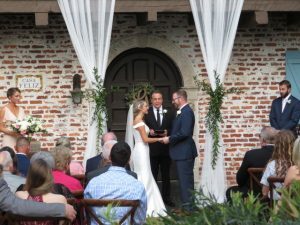 Lon Tosi of Celebration, Florida and the Orlando team of officiants from Sensational Ceremonies worked closely with the couple to build a warm and heartfelt ceremony that reflected their special love. The couple wrote letters to one another that they exchanged in during the ceremony, to be opened on their first anniversary. They listened to the amazing reading The Blessing of The Hands as presented by Lon. And exchanged vows that were hand-picked to reflect their importance to the couple. It all ended with a gorgeous reading – All I Want, that ends with these gorgeous words: “All I want, is to love you – forever”. Wow, what a beautiful wedding ceremony. The talented KT Crabb from KT Crabb Photography was on hand with her team to capture the most magical moments from the ceremony. We are certain that the photos will be amazing! An array of A-List vendors made this event a supreme showing. DJ PJ from Atomic Entertainment provided the vibes and sound for the ceremony and reception. That stupendous three-tiered cake was developed and designed with real roses. It was so beautiful, as provided by Anna Cakes. Thanks to Laura Reynolds Artistry the bride and her party looked so beautiful! The colorful and rich florals were delivered and staged by The Flower Lady. Donna, her team did a fantastic job! One of the most successful caterers in Orlando Authur’s Catering and Events provided the delicious fare for the evening. Black Diamond Luxury Transportation made certain that the most important people at the event, April and Doug and their bridal party made it to the wedding on time! It should be noted that As You Wish weddings and events made certain that the entire event went off right on schedule. Everything was smooth an wonderful thanks to Moncia and her team made all happen with class and elegance. We at Sensational Ceremonies want to wish April and Doug all the best with their marriage. They certainly are off to a great start!